Nothing comes close to Graduation Honor Medals as the leading symbol of triumph and achievement in any stage of one's academic journey. 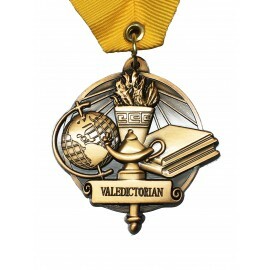 They come in different types - the Valedictorian Honor Medal, the Salutatorian Honor Medal, and the Graduate Medal and are used as a symbol of distinction and honor for outstanding graduate in each graduating class. Gradshop's Graduation Honor Medals are nothing short of works of art which exceed all known standards of quality, design and craftsmanship. These top quality symbols of academic excellence come in brilliant bronze complete with engravings and a standout gold fabric neck band. Get in touch with us today to learn more about our wonderful Graduation Honor Medals selection.